The eco-friendly home of your dreams could be constructed in as little as six weeks, if you take Avalon House as an example. 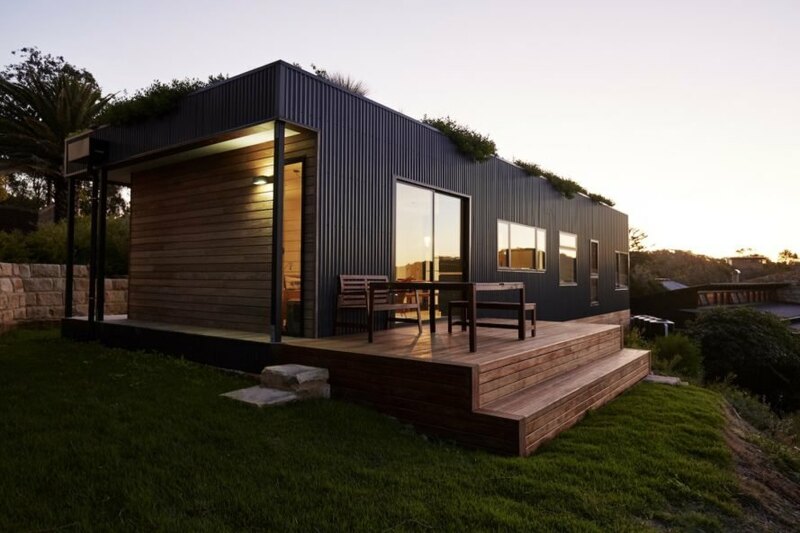 Designed and built by Australian design studio Archiblox, the Avalon House is a modular green-roofed home that was prefabricated off-site and installed on a coveted beachside property in under two months. Located in New South Wales, the green-roofed beach retreat has a low-impact environmental footprint, from the minimal construction waste to the use of FSC-certified timber. The 106-square-meter Avalon House may be diminutive in size, but is big on design, which builds on the illusion of spaciousness. The house, which is oriented to oceanfront views, is clad in FSC-certified blackbutt hardwood timber milled from sustainably managed forests and topped with a green roof that minimizes rainwater runoff and solar penetration. The south and east facades open up to an outdoor veranda that blends indoor and outdoor living. The modular home is raised on a set of structural posts and sits lightly on the sloping site to reduce water flow. The home’s long and linear east-west orientation allows for panoramic ocean views and cross-ventilation. Windows are minimized on the south side, while large amounts of glazing wrap around the north facade for access to natural light. The bright and airy interior places an open-plan living area, dining space, and kitchen on one half of the home, while a master bedroom, a small two-bed bedroom, and a bathroom occupy the other half. Low VOC paints and natural oils were used throughout the interior. The 106-square-meter Avalon House may be diminutive in size, but is big on design, which builds on the illusion of spaciousness. 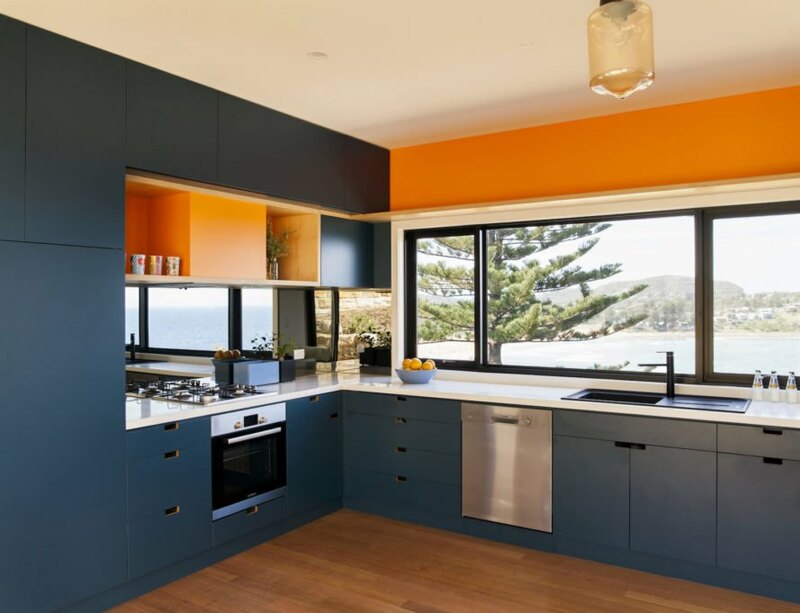 The house, which is oriented to oceanfront views, is clad in FSC-certified blackbutt hardwood timber milled from sustainably managed forests and topped with a green roof that minimizes rainwater runoff and solar penetration. The south and east facades open up to an outdoor veranda that blends indoor and outdoor living. The modular home is raised on a set of structural posts and sits lightly on the sloping site to reduce water flow. The home’s long and linear east-west orientation allows for panoramic ocean views and cross-ventilation. Windows are minimized on the south side, while large amounts of glazing wrap around the north facade for access to natural light. The bright and airy interior places an open-plan living area, dining space, and kitchen on one half of the home, while a master bedroom, a small two-bed bedroom, and a bathroom occupy the other half. Low VOC paints and natural oils were used throughout the interior.